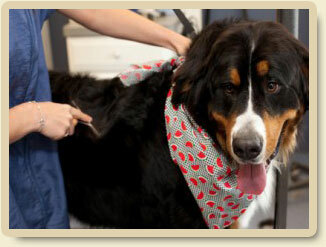 Beneficial to all dogs, Morris Animal Inn is proud to offer Shed-Less Treatments. During this extraordinary treatment, dead hair and dander is removed from your pet in our state-of-the-art spa. This is the hair and dander that would eventually be shed in your home and car. Not only will this service benefit your pet but you as well. We highly recommend this treatment if you are sensitive to pet dander or hair, or simply dislike the constant cleaning of pet hair. Shed-Less Treatments do not stop the natural shedding process, nor is this a one-time cure.